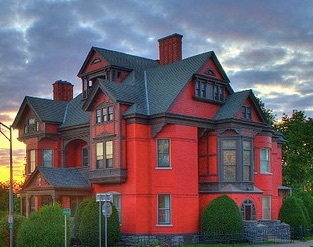 The Greene Family Mansion, which still stands on Amsterdam’s Market Street. Today’s Amsterdam Birthday Celebrant was quite likely Amsterdam’s most significant industrial visionary. Born on July 18, 1816, Greene started his upstate New York manufacturing career in 1840 when he became partners in a Hagaman-based firm called Waite, Greene & Company, which manufactured satinet. Satinet is a finely woven fabric with a finish that resembles satin, but is made entirely with cotton or wool. Two years later, Greene left that firm to create a new one a few miles south, in Amsterdam. What attracted Kimball to this area in the first place was water, specifically the 300 foot drop the Chuctanunda Creek makes beginning three miles north of the Mohawk River it empties into. Greene was one of the first to recognize that capturing the energy of that moving water could create enough power to propel huge industrial processes. You can read the rest of my story about this amazing Amsterdam industrialist in my new book “A Year’s Worth of Amsterdam Birthdays.” To order your copy, click here. This is very interesting, I never knew that “Liberty’s” first residence had such an interesting history. Yes Joan, and I know Liberty is honored to serve as its caretaker today.